It's been our busiest ever gleaning year in Kent. So far we've run 25 gleans (most of which have been in the past two months) and alongside our usual public gleans, we've been working with school and educational groups to get children and young people out into the fields and undertaking classroom sessions exploring ways to reduce food waste. But we're not finished yet! Children are very welcome on the apple glean but I'm afraid we're restricted to volunteers over the age of 18 on the potato and cabbage glean as we'll be using knives to cut the cabbages. I'm away this coming weekend so travel arrangements for the 28th will be done on Monday. Do please ensure you've signed up by then if you'd like to join us as there won't be much time for me to arrange lifts and station collections upon my return. You'll get the usual call out email for the glean on 14th December nearer the time, but if you'd like to sign up early please do (it makes organising these days so much easier when we have the luxury of planning ahead). 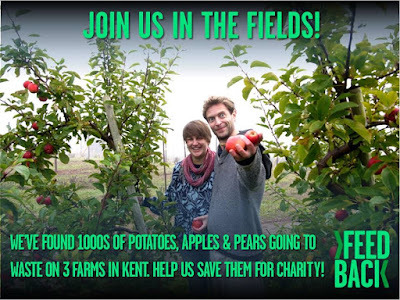 I do hope you can join us for a final fruit or veg rescue mission in 2018!